One of the key factors in ending up with really clean laundry is to not overload the washer. Clothes need room to "swim" in the water and detergent solution during agitation to remove soil and stains. If the washer tub is jam-packed, some clothes will have limited exposure time to the cleaning solution and will come out with their original stains and odor. That's why it is important to know the capacity of the washer you are using so you don't overstuff. But how big is your washer drum? If you have lost your washing machine manual and you need to know the capacity of your washer tub, it is simple to calculate. This is also helpful if you want to replace an older machine with one with the same washing capacity. Determining your washer's capacity will also help you know how many clothes it should hold in every load to get good results. Use this equation to calculate the volume or holding capacity of the washing machine tub; assuming all measurements are in feet. Note: The units result in (cu. ft.). ft times ft times ft = cubic feet. Make all measurements in feet. Measure the radius of the tub; from the center of the tub to the outside wall of the tub. Alternatively, measure the diameter and divide by two. This is the radius. Using the formula, multiply the radius by the radius; note this is not the same as multiplying the radius by two. This is equivalent to the radius squared. Multiply the radius squared from step three above by pi (3.14). Multiply the value from step four by the depth of the tub to find the cubic feet volume or capacity of the washer. If you are searching for a new washer, different styles are sold with the capacity listed in cubic feet. Compact washers are usually 2.30 to 2.45 cubic feet. Both standard and high-efficiency top load washers range between 3.1 and 4.0 cubic feet. Front load high-efficiency washers can range from 4.0 cubic feet to an extra large capacity of 5.0 cubic feet. Most front loaders are between 4.2 and 4.5 cubic feet. Now that you know the size of your washer drum, you can figure out how much laundry it will hold in each load. Remember, while it is economical in both utility costs and time management to do full loads, you should never cram clothes and overstuff a washer just because you can. When automatic washers became commonplace in homes in the 1950s and 1960s, the washer manufacturers began using the term "load of laundry." At that time, the capacity of most washers was around eight pounds of clothes or linens. As washers got bigger, so did the pound limits of "a load." The introduction of high-efficiency washers that contain no center agitator increased the load capacity. Front load high-efficiency washers rely on a tumbling action to move clothes through the cleaning solution and top load high-efficiency washers use a bottom paddle agitator leaving more space for dirty clothes. Since washer capacity is figured in cubic feet, a measurement of space and dirty laundry is measured by the pound, a weight measurement; you can't do a one-to-one conversion. Today, every washer comes with a capacity recommendation. 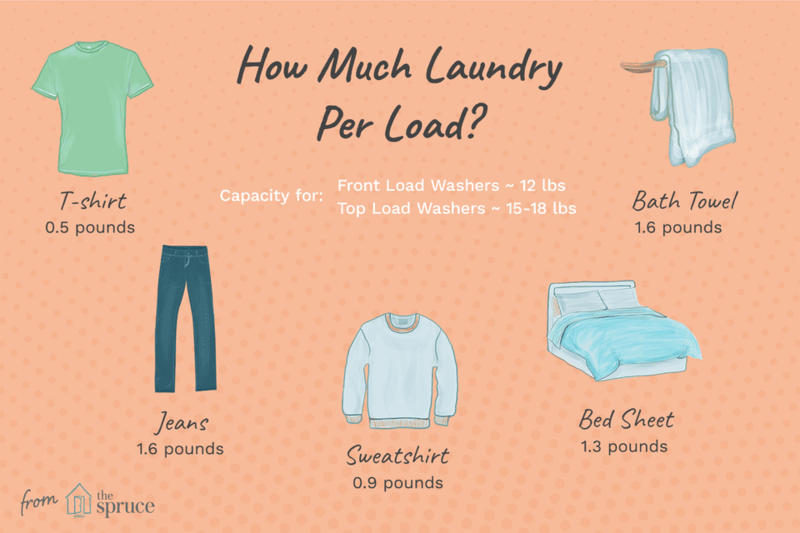 As a rule of thumb, 12 pounds of laundry is appropriate for a standard capacity top load washer, 15 to 18 pounds for a front-load washer, and 20 to 22 pounds for an extra large capacity front load washer. These weights give you a good guideline as to how many of each item can fit in a load of laundry. After you have sorted the laundry (as you always do, I'm sure), you should weigh your empty laundry basket and then fill it with what you estimate as a full load of dirty clothes. Weigh the filled basket again and adjust appropriately. You may be able to wash more or you may need to remove some items. Now you're ready to load the washer and select the appropriate water temperature and cycle. If you have several members of the household doing laundry, take some photos of a full load or post the appropriate weights on a bulletin board. It might just give you cleaner clothes and help your washer last longer.